Cats Protection's popular Celebrity Paws auction is back, with 30 unique celebrity artworks framed and ready to purchase this December. Now in its fifth year, the auction helps us raise vital funds to help unwanted and abandoned cats and kittens in the UK. 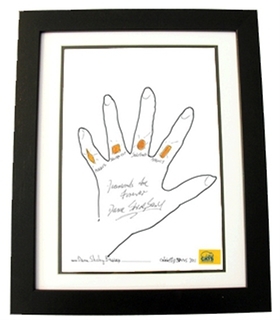 Celebrities were asked to draw around their hand, sign it and style it in their own unique way. 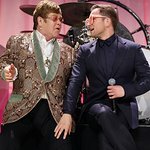 A host of kind-hearted celebrities have contributed their distinctive drawings this year including singer Dame Shirley Bassey, chef Gordon Ramsay, Strictly Come Dancing judge Bruno Tonioli, Glee star Heather Morris, actress Brigitte Bardot, England cricketer Graeme Swann, author Jeffrey Archer and comedy legend Terry Jones. This year, following the success of artist Tracey Emin's drawing last year, the charity also targeted stars of the art world and received some exceptional contributions from a variety of artists such as well known illustrator Quentin Blake, Simon’s Cat creator Simon Tofield and Viz cartoonists Graham Dury, Simon Thorp and Chris Donald.